LONDON, (Reuters) - Jailed former Nigerian oil state governor James Ibori hid some of his assets in the oil firm Oando and money passed from the company's accounts to Ibori's Swiss accounts, a British prosecutor told a court on Monday. Ibori, who governed Delta State from 1999 to 2007 and influenced national politics, was jailed for 13 years in Britain after pleading guilty in February 2012 to 10 counts of fraud and money-laundering worth 50 million pounds ($79 million). One of the biggest embezzlement cases seen in Britain, the successful prosecution of Ibori was also a rare example of a senior Nigerian politician being held to account for the corruption that blights Africa's most populous country. A three-week confiscation hearing began at London's Southwark Crown Court on Monday during which prosecutors will present evidence of Ibori's assets and seek court orders to have them seized. Defence lawyers will dispute the prosecution case. Prosecutor Sasha Wass told the court she would be presenting evidence that Ibori had "asserted ownership of a large part" of Oando, Nigeria's biggest home-grown oil firm which is listed in Lagos, Johannesburg and Toronto. "The Crown will assert that Oando is a company where James Ibori has hidden assets," Wass said, giving no further details. She is expected to elaborate later in the proceedings. Oando is not a party to the case, although British lawyer Andrew Baillie was in court representing the firm's interests. A spokesman for Oando in Lagos said that in 2004, the company had sold $2.7 million of its foreign exchange earnings for naira in three transactions over about seven months with a company that had turned out to be controlled by Ibori. Oando did not know at the time that Ibori was behind the company, he said. The spokesman also said that at present, Ibori had an "insignificant" shareholding in Oando. 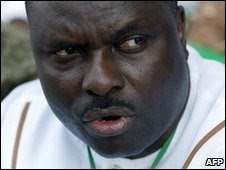 At the time of Ibori's sentencing in April 2012, Judge Anthony Pitts said the 50 million pounds that he had admitted to stealing may be a "ludicrously low" fraction of his total booty, which could be more than 200 million pounds. The confiscation hearing will shed further light on the scale of Ibori's wealth and determine whether he emerges from jail impoverished or still in possession of a large enough fortune to regain a position of influence in Nigeria. Wass said Nuhu Ribadu, a former head of Nigeria's anti-graft agency EFCC, would testify later in the hearing. He alleges that in 2007, Ibori tried to stop EFCC investigations into his affairs by offering Ribadu a bribe of $15 million in cash. Ibori, who is at Long Lartin maximum security prison in central England, could be released as early as 2016 because he spent two years in custody before his sentencing and because he will be eligible for parole halfway through his prison term. He was not in court on Monday and his lawyer Ivan Krolick said Ibori did not wish to attend the confiscation hearing although he would come to court to give evidence if necessary. In May, the Court of Appeal had rejected Ibori's appeal against the length of his sentence. During his sentencing hearing, the court heard Ibori had acquired six foreign properties worth 6.9 million pounds, a fleet of luxury cars including a Bentley and a Maybach 62, and that he had tried to buy a $20-million private jet. His three daughters were attending a private school in rural England. British authorities hope Ibori's case may stop corrupt Nigerian politicians looking to Britain, Nigeria's former colonial ruler, as a place to spend money on houses, luxury goods or private education for their children.